Presented without fanfare in 1976, the little 125 CG was the most basic Honda, but also one of the most carefully considered. This modest 125 would conquer the entire world, particularly the less-developed countries. 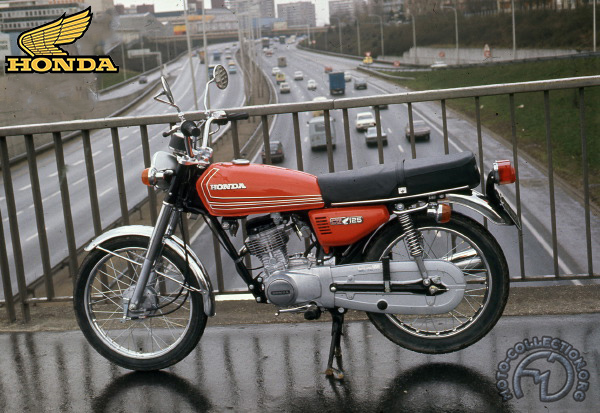 Still in production today (both by Honda and under license), it is incontestably the bike that is built in the largest numbers. Honda was being totally restructured under the leadership of its vice-president Kihachiro Kawashima in the mid-1970s, and was attacking the world markets on all fronts. The Japanese leader was wooing the Western world with a wealth of high technology features, but it was also studying the Third World – the biggest untapped market. To serve it, Honda built a new factory dedicated to motorcycles of 100-125cc and designed the astoundingly simple 125 CG. Even though it followed the general lines of the 125 S, the CG differed from it in many constructional details, all aimed at the same goal: economy. The least visible but the smartest of these was the valve gear. Honda, which had long championed overhead-camshafts, here abandoned this technique in favor of pushrods and rockers. It simplified this old-fashioned layout – which normally called for a pair of camshafts in the crankcase – by using an old design, formerly used by NSU (on the 100 Fox) and Parilla, with a single-cam actuating inclined intake and exhaust valves through rockers. Economical, easy to build and needing a minimum of maintenance, the CG is an indestructible utility machine available in l00 and 125cc forms with 4- or 5-speed gearboxes.